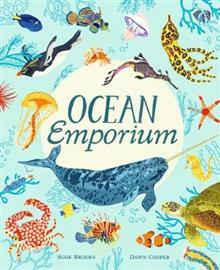 Get ready to dive into the fantastic world of the Ocean Emporium. A secret, watery world covers the greater part of our planet and some of Earth's most incredible animals live here. In this book, you can travel under the waves to discover an extraordinary variety of creatures. Yo... read full description below. Get ready to dive into the fantastic world of the Ocean Emporium. A secret, watery world covers the greater part of our planet and some of Earth's most incredible animals live here. In this book, you can travel under the waves to discover an extraordinary variety of creatures. Your journey will take you from dolphins leaping in sunlit waters and colourful angelfish swimming in the shallow seas around coral reefs, to giant octopuses and mysterious anglerfish that live in the dark abyssal world of the deepest oceans. Be thrilled by the confrontation between a pack of orcas and a great white shark, and amazed by the size of the snaking tentacles of the lion's mane jellyfish. Dive into this treasure trove of sea creatures and immerse yourself in a wondrous underwater world. This glorious compendium is the perfect gift for young nature lovers and anyone who loved David Attenborough's Blue Planet. Award-winning author Susie Brooks has been writing children's non-fiction and picture books for over 10 years. Inspired by worldwide travels, she is fascinated by the unusual and the extraordinary. Dawn Cooper's work is influenced by the natural world and botanical illustrations, as well as things she has read about or seen on her travels. She draws everything by hand in a sketchbook, before making digital illustrations with lots of colour and texture.